So Now You're A Shareholder... What Happens At Those Annual Meetings? Why Would Anyone Want To Be A Green Bay Packers Shareholder? There is only one place those words make complete sense. Yes, even on a hot, bright summer day in July, when any pate covered in orange foam material had to be sweating more profusely than a Vikings fan in a purple jersey in a stadium full of green and gold: Lambeau Field, in Green Bay, WI. It’s the home of the Green Bay Packers. 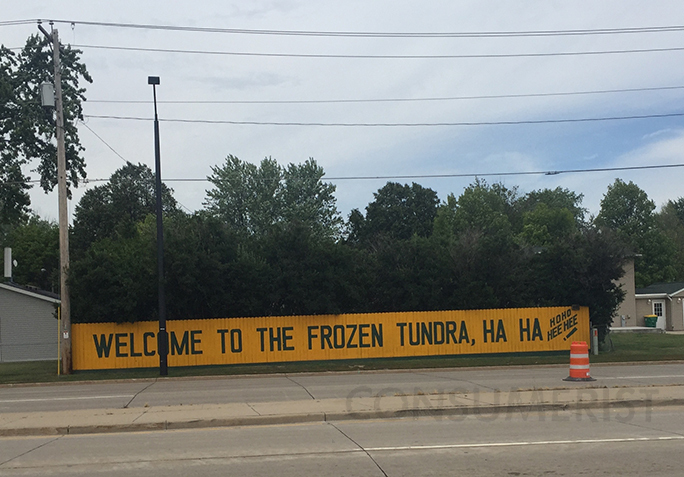 There were a few funny things about being at Lambeau at the end of July: first of all, it’s July, a month that traditionally sees very little football or football-related news. The stadium was hosting 12,000 or so people that day for the team’s Annual Meeting of Shareholders. In other words, a gathering of some of the most devoted fans, those willing to shell out some cash just for love of the team. Another funny thing? There actually were a few Vikings fans brave enough to get into the mix that Tuesday morning. Before we go any farther, it’s important that readers should know I am not only a Packers fan, born and raised in Milwaukee and with a heart that bleeds cheese, but I’m also one of 360,760 shareholders. Together, we own the Green Bay Packers. That’s probably most common question I encounter when people outside the Packer fan world find out that I’m a shareholder. The simple answer? Nothing — at least not in financial terms. That’s when people may look at you like you’ve thrown cold, hard cash in the garbage and set it on fire while dancing around it gleefully… perhaps mixed with a slight, grudging respect. Shares of stock include voting rights, but the redemption price is minimal, no dividends are ever paid, the stock cannot appreciate in value, and there are no season-ticket privileges associated with stock ownership. No shareholder is allowed to own more than 200,000 shares, a safeguard to ensure that no one individual is able to assume control of the club. That pride can turn into financial gain for the organization of course, as shareholders have access to an online pro shop that is reserved just for owners: Stock holders have to enter their certificate number in order to access the shop, where they can buy clothing that says NFL Owner and other paraphernalia. And when the Packers have won the Super Bowl, shareholders get the chance to buy a ring as well — albeit a different, cheaper version than those the players receive. And the fans get to have a team. Literally, the Packers cannot leave Green Bay for another city. And if it hadn’t been for shareholders willing to fork over cash to support the organization, all the way back in 1923, there wouldn’t even be a team today. Acme Packing Company bought Indian Packing and all its assets, and the team’s finances eventually took a dive toward bankruptcy. The brand new American Professional Football Association (the predecessor of the National Football League) revoked the Packers franchise after Lambeau was accused of some shenanigans involving using illegal college players in a non-league game. By the 1922 season, Lambeau had reapplied and the league reinstated the Packers, with himself as the owner. Another turn for the financial garbage pit stirred a few wealthy members of the community to cancel Lambeau’s debt, and then rallied the commented behind the team. The club became a nonprofit entity, the Green Bay Packers Corporation, in August 1923, while more than 400 people attended at a local Elks Club. That day marked the first of five stock drives in the team’s 92 years (1923, 1935, 1950, 1997, 2011) and was the first of at least three sales that the organization credits with helping to stabilize the Packers financially. That brings us to up to today: though the NFL doesn’t allow corporate memberships as part of its bylaws [PDF] — clubs must be entirely owned by a single owner or a small group of owners, one of whom must have a 1/3 stake in the team — the Packers were given an exemption to that rule, since the communal ownership of the team predates NFL rules. For all anyone knows, those five stock drives could be the only five stock drives. There are currently no plans for the team to release any more stock. It could be two years, it could be 20 — or it could be never. So Now You’re A Shareholder… What Happens At Those Annual Meetings? Another “perk” that sets your Packers fan who is a shareholder apart from other Packers fans — those with stock get to go the annual shareholder meeting on the last Tuesday (usually) in July. Even then, regular fans can come along, as each shareholder gets four tickets to the event. “But what happens there?” my boss continued to question me on this particular day, visions of wild cheese dances and hob-mobbing with players no doubt dancing in front of her eyes. And to that, I didn’t have an answer. Despite the fact that I’ve owned a share since the last release in 2011-2012, and that I’d been a fan of the Packers since Brett Favre entered my life at a young age, I’d never been to Lambeau for a game, much less the meeting. So really, there was only one way to find out. This year was the year when I’d really crack the code and meet a bunch of other people like me. Driving through the city of around 104,000 it is quite clear what everyone here is about: Getting off I-43 North offers the first glimpse of Lambeau Field in the distance. Street signs along the way through Green Bay proper say it all: there’s Holmgren Way (named after Mike Holmgren, head coach of the Packers from 1992-1998) and Packerland Dr., not to mention the street Lambeau Field sits on, Lombardi Avenue, named after Vince Lombardi, coach of the Packers from 1959-1967 (including the teams that won the Super Bowls I and II) and the guy the Super Bowl trophy is named after. Shareholders and their guests streamed through two of the open gates in a veritable river of green, gold and white, with jerseys bearing the names of current players Rodgers (Aaron), Matthews (Clay), and Nelson (Jordy) as well as past favorites White (Reggie) and yes, even Favre (Brett), who somewhat infamously ended his career with Packers Sworn Enemy No. 2 — after the Chicago Bears — the Minnesota Vikings. Everyone received a copy of the meeting’s agenda and a list of speakers, as well as the financial disclosures for the organization including statement of income and a balance sheet for the years ending in March 2014 and 2015. • If shareholders were super heroes, their not-so-secret power would be voting for the board of directors, which currently has 42 members and a seven-member executive committee, including the only paid member, CEO and President Mark Murphy. • Board members can be nominated for election by the current board, or by stockholders ahead of the annual meeting, with each serving staggered three-year terms (mandatory retirement is at age 70). • If Chicago Bears fans wanted to take over, they’d have convince all other shareholders NOT to vote for the board nominees selected by the current board and fill those positions with their own nominees (who would have to be Packers shareholders), every year until the board was filled with Bears plants. And then somehow plan a coup to take down the CEO and President. This would likely require mind control devices or widespread amnesia. People milled about near open concession stands (like “Pac ’N’ Cheese, a name that delighted me though I didn’t have a chance to sample its dairy wares), parents carried around babies in Packers onesies and families tried to get seats as close to the field as possible. The atmosphere was relaxed, yet with the air of a very special event. After all, how often do a bunch of shareholders have a meeting at an NFL stadium? Though any chance to gather at Lambeau would surely qualify as special for fans, the purpose of the shareholders meeting is a lot like any other gathering of investors, and therefore, dry in its essence: Shareholders officially vote in a board of 25 directors — though all are urged to vote their shares by proxy online or by phone ahead of the meeting — and those directors update the owners about all the financial goings on. There’s the general welfare of the team, updates on charitable donations and community outreach programs and all the kinds of reports one might expect in your average conference room or meeting hall. Except in this case, it’s taking place at Lambeau Field, with the board on a raised platform on the grass while the 12,000 or so shareholders and guests sweat it out on the stands. There was still a PowerPoint, albeit displayed on a Jumbotron. And sweat it out, we did: The meeting kicked off at 11 a.m. sharp, right when the sun was really getting up there in the cloudless sky, and there were only a few spots of shade. But as Packers President and chairman of the board Mark Murphy noted in his opening comments, being hot at Lambeau is just one of those things you can’t complain about. “I want to thank you all for braving the heat, coming out today. But in Green Bay, we can’t complain about heat,” Murphy joked with a laugh, urging people to stay hydrated. As for celebrity faces, no, there were no players hanging around to give out high fives. 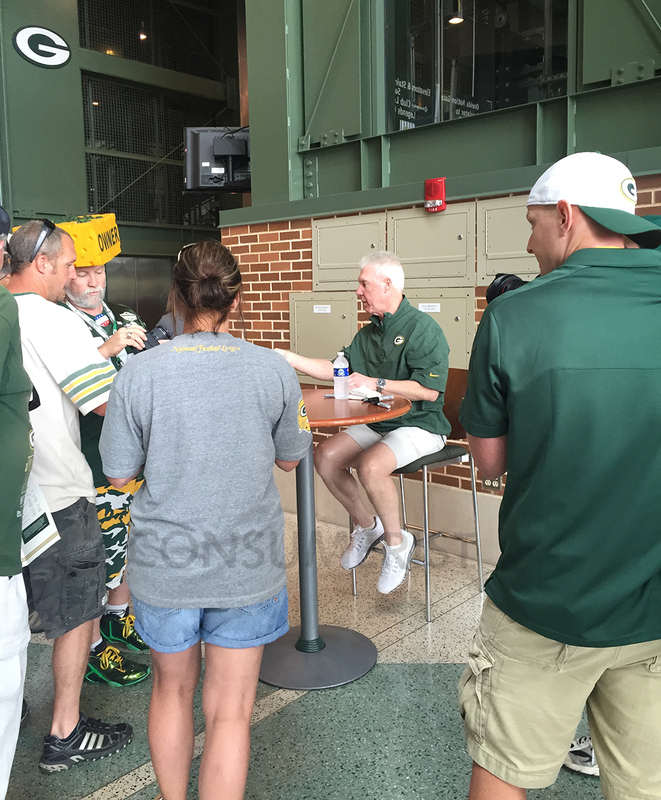 But the stadium cheered lustily for General Manager Ted Thompson, a celebrity in his own right around Green Bay, when he took to the microphone for the football report. What followed in his roughly eight-minute speech included a recap of 2014 jam-packed with the kinds of stats that a fan slobbers over and loves to recite later to an opponent who is rolling their eyes the entire time: according to Thompson, the Packers led the NFL in most first downs, averaged over 39 points per game at Lambeau Field and had an undefeated record there, led the NFL in scoring, achieved a +14 turnover ratio, earned its fourth straight divisional title, and made the playoffs for the sixth consecutive year. After highlighting some individual team highlights and thanking the various members of the organization, including head coach Mike McCarthy and his staff and the player personnel group, complete with photo snapshots of Packers employees. Thompson ran through the 2015 offseason next, noting the re-signing of various players, discussing this year’s draft choices, the upcoming schedule of practices and other events, including Family Night, where the players practice on Lambeau Field in front of the fans instead of at one of their outdoor training fields (where fans also gather to watch every practice day). Once the football business was through, Murphy took to the mic once again for the business side of the business with the President’s Report — and stayed there for about 45 minutes. Achievements were discussed, highlights of the season income were shown in a video set to a generic rock song, stadium renovations were mentioned and new campaigns and policies were touched on. While sponsorships were mentioned, Murphy made sure to note something that may also prove to be rare in the world of professional sports, where teams are owned by multimillionaires. “We did not sell the naming rights to the stadium — we will never do that, we will always be Lambeau Field,” Murphy said, to enthused applause, adding that to make up for that, the organization does sell the naming rights to individual gates at the stadium. This all went on for what started to feel like eternity, as the unrelenting sun beat down on the crowd. You want to know what being a Packers shareholder feels like? On that day, it was hot. Very hot and very sweaty. Just before noon, as I wondered yet again if that one cloud would come back and cover the sun even briefly, I noticed that the crowd had thinned out considerably. And then, once Murphy wrapped up his report and passed the torch to the treasurer, there was almost a mass exodus as the crowd thinned out considerably. Someone nearby mumbled, “I feel bad for him,” as the seven or so board members to follow marched to the podium to issue reports on finances, director affairs, investments, sales and marketing and community relations and others made their official announcements before the rapidly diminishing crowd. By about 12:45, Murphy had once again reclaimed the mic and made his closing remarks. A sprinkling of cheers and applause followed, but if the stadium was leaking people before then, it was turning into a ghost town now as fans headed to the relative shade of the concourse and congregate in the new entrance to the Atrium, a two-year, $140.5 million renovation project completed in June, using only money from the team and no public funding. It’s home to the Packers Hall of Fame, the Pro Shop, and more importantly, it’s air-conditioned. There, fans could mix and mingle with each other, wait in line for the stadium’s new restaurant, take photos with a jersey that says “SHAREHOLDER” and even line up to take photos with Thompson, who sat at a table and signed autograph after autograph. Now that my curiosity had been satisfied on the “What happens front,” I wanted to reach out to my fellow shareholders and get to the heart of the “why” everyone wants to know: why shell out perfectly good money — $250 per share, in the case of the 2011-2012 stock drive — only to never see a cent of it again? Sure, long shareholder meetings are fun… but who are these shareholders and why are they willing to kiss their money good-bye? I knew my own reasons — It was gift I gave myself, a sign of my devotion to the team and to its future, and yeah, it’s fun to say I’m an NFL owner. Shareholders include the young, the old, men and women, brothers and sisters, friends and in some cases, even fans of rival teams. In many groups I talked to, only one person would be a shareholder, accompanied by a family member or friend. In other groups, everyone owned a piece. 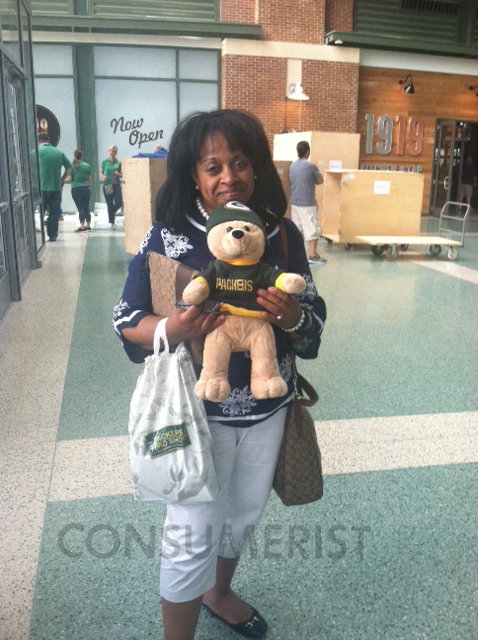 Cathy from Milwaukee shows off her friend, who cannot own stock as he is a bear. Not all shareholders are from Wisconsin, as stock offerings can be purchased by anyone in the U.S., according to NFL rules: I spoke to fans and owners from Colorado, Indiana, Iowa, Virginia and yes, WI. And yes, there was even a rumor of Minnesota Vikings fans that had been spotted (a duo whose presence was later confirmed by the Minnesota Star-Tribune). But to a person, everyone I spoke to remembered not only when they became a shareholder, but also how many Packers games they’ve attended in person, down to the year and month if not the date. The most common response I had when I asked people why they were shareholders? Love. Love of the game, love of the team, love of the Packers community and all the history that goes with it. “It’s about the hard love of the team,” said Michael, who lives with his wife (and shareholder) Kelly in Colorado. They brought their two kids to the meeting this year, this first time they ever attended. Sure, it was a little hot out, especially for the kids, but the timing was right to have everyone at Lambeau. Carrie and her mom Lindy have come to every meeting since Carrie and her brother received their shares as Christmas gifts in 2011. Carrie travels from her home in Indiana, and her mom comes from Iowa. The family had lived in Wisconsin in what Lindy calls “The Bad Times” back in the early ‘80s and then moved away. Once her son became a Packers fan in the Favre era, she says they just embraced it and all became fans as well. T.J. from Stevens Point, WI says he only has one share of the team, but if he could have 100,000, he’d have done it. He pointed to the sense of community as one of the biggest reasons why he decided to become a shareholder. “It’s really cool how even in the meeting you heard [Thompson] say, ‘We’re all Packers.’ It’s not just if you take a snap or you block a punt, it’s just you as a shareholder are also part of the team,” T.J. explained. 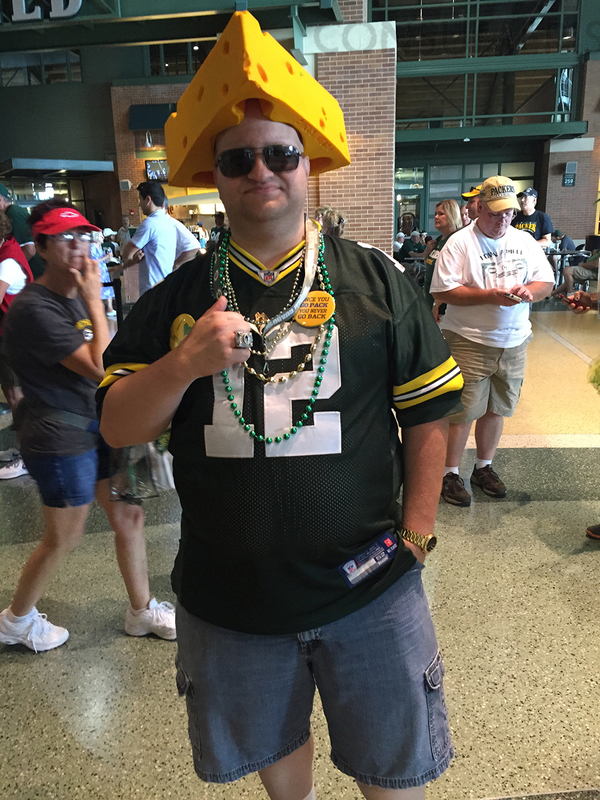 Meet T.J., a Packers shareholder. 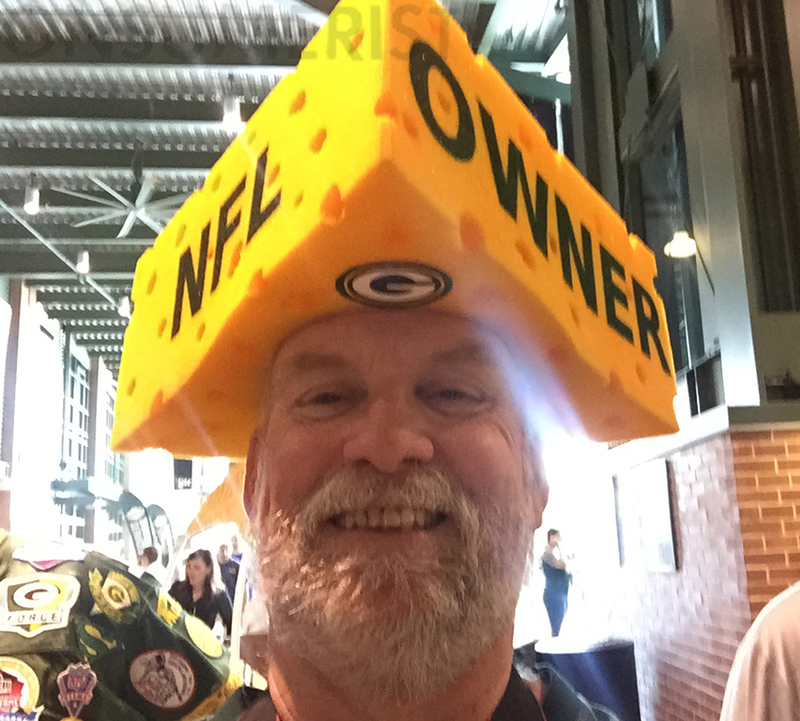 He has owned many cheeseheads. 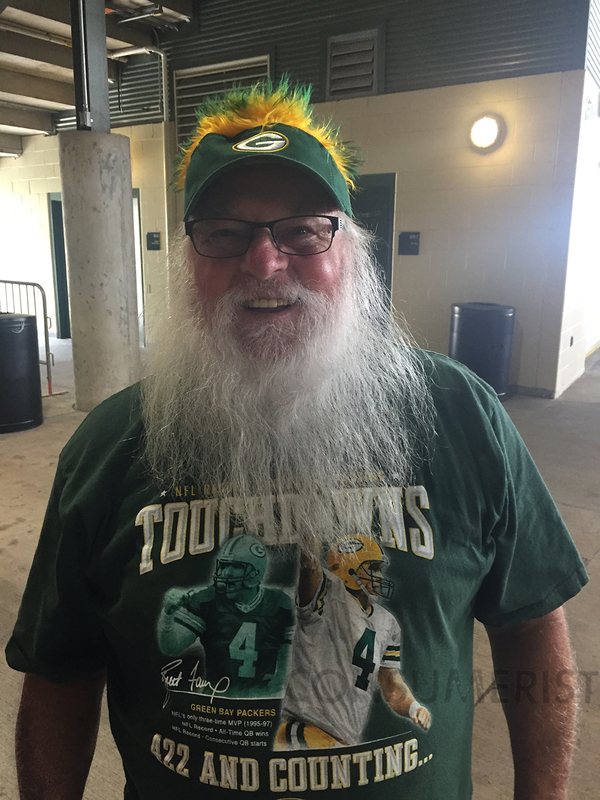 Another shareholder I met goes by the name Santa Tom, a moniker that is self-evident when meeting him, if Santa is indeed, a Favre fan: Snowy white beard, eyes that twinkle mischievously and a crazy hat with green and gold hair. Santa Tom bought his share in the 1997 stock drive, and attended the meeting with his friend “Just Jim,” who purchased his stock in the 2011-12 sale. This was their first shareholder meeting, basically because one of them is retired and the other will be soon, so why not take a Tuesday to sit in the sun and listen to Packers talk? Santa Tom or REAL SANTA?!? Santa Tom says for him, owning stock is all about being a part of history, and tradition — he says his son who lives in San Diego puts out all his Packers paraphernalia every Sunday, despite the static he gets from Charger fans. His son doesn’t have a share yet, but he figures the next time it comes out, he’ll get him one. Though the meeting was hot, neither man walked out — though they admitted that the most interesting parts were Murphy and Thompson’s reports. It’s not like shareholders are duped into thinking there’s a financial gain to be had anyway, says Steve, middle name, “The Owner” (a name he uses on business cards, along with photos of him decked out in all his Packers regalia). He’s somewhat rare in the people I met, in that he has two shares of stock — one purchased in 1997, and another in 2011. “It’s a play on words. If you own stock in anything, technically you’re an owner,” notes Steve. “I’m not a true owner. And I know that.” But that doesn’t matter, he adds. “I wasn’t looking for any benefits, other than to be a part of my team. And then we get to come here and be a part of the family in a unique way,” Steve says. “Look at it like this: So if your team offered a chance that you could support your team for a couple hundred bucks, you wouldn’t do that?” he asks. Steve checks his camera to make sure he got a good shot of Ted Thompson greeting people after the meeting. 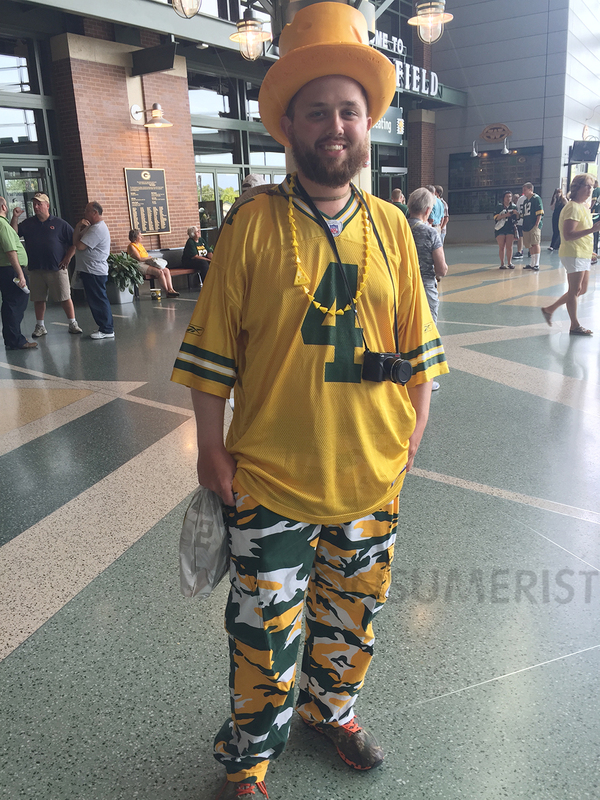 Andy from Virginia was proudly showing off his cheesehead top hat (bought at the airport at some point) while explaining that he usually wears Favre socks, but didn’t have them on that day. He’s been a fan since 2001, and has been going to shareholder meetings since he bought stock in 2011. He says drives up to go to games at Lambeau every year, and is planning on going to two games this season. Andy drove from Virginia for the shareholders meeting.